The RN-XV module is based upon Roving Networks' robust RN-171 Wi-Fi module and incorporates 802.11 b/g radio, 32 bit processor, TCP/IP stack, real-time clock, crypto accelerator, power management unit and analog sensor interface.The module is pre-loaded with Roving firmware to simplify integration and minimize development time of your application. In the simplest configuration, the hardware only requires four connections (PWR, TX, RX and GND) to create a wireless data connection. 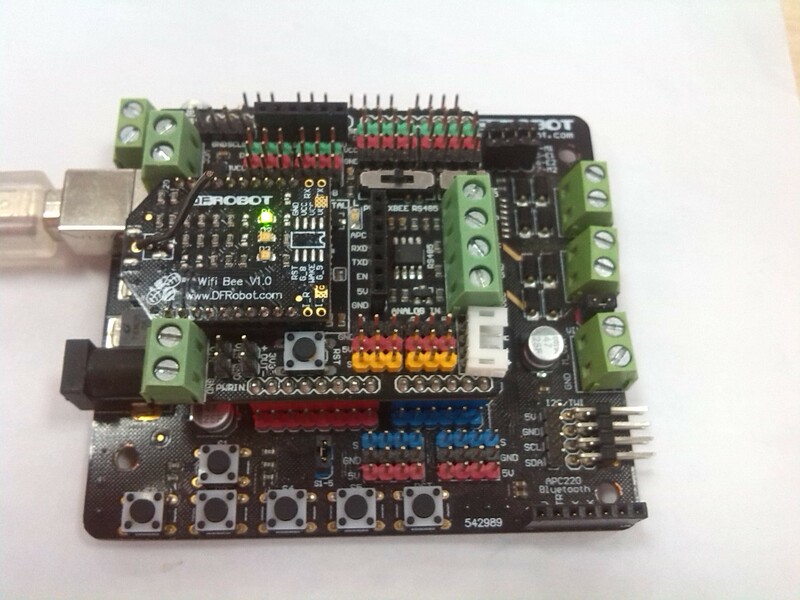 The Xbee module is widely used in the United States, Canada, Australia, Israel and Europe. The establishment of RF communication does not require any configuration and the module's default configuration supports a wide range of data system applications. You can also use a simple AT command to advanced configuration. An OEM developer is now XBee code development package. 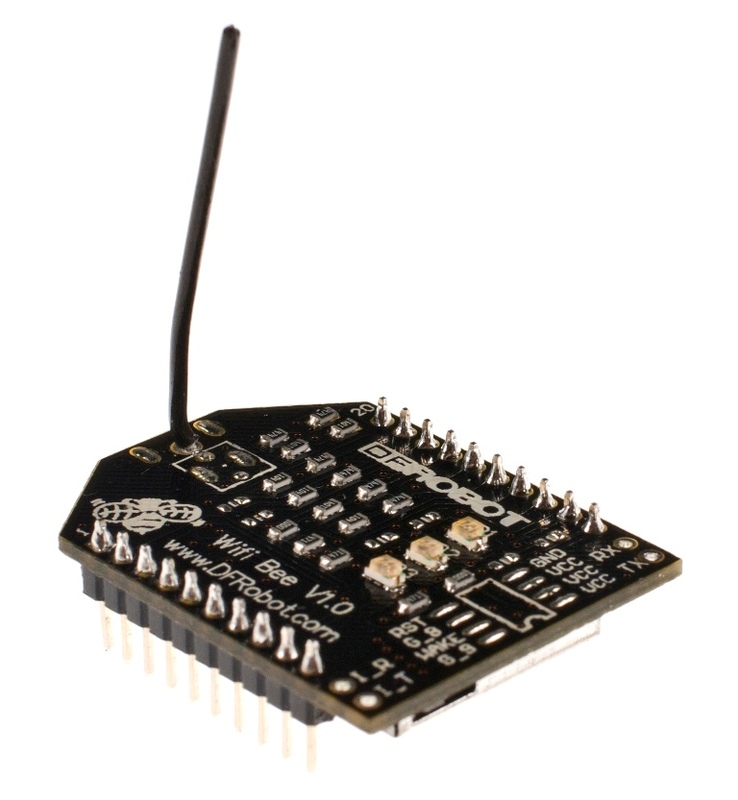 It is self-developed in collaboration with the MaxStream ZigBee/802.15.4 RF module code. In this section, we will use the Wifi Bee to create a Web server as an sample application. Let's follow the steps below to make it work! 1. We need a serial monitor for configuring the WIFI Bee setting in this part. There're lots of good tools like putty,CoolTerm and Arduino serial monitor. In this case, we choose the Coolterm, which is compatible with both Windows and Mac. 3. Click the "Connect" botton and open the com port. 4. Send AT command $$$ to the wifi Bee and it will reply "CMD" to indicate that it enter the command mode properly(if you use Arduino IDE, make sure this command has no line endings). 5. Type show net and it will show current network settings as Figure 2 shown(switch to both NL & CR line endings, to input AT commands). 6. 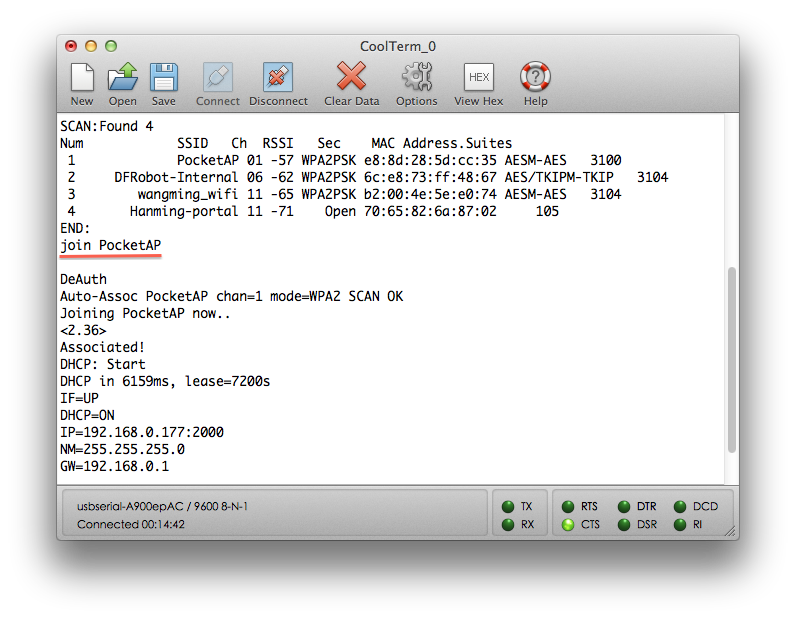 Type scan to view a list of Wifi networks around as Figure 2 shown. 7. 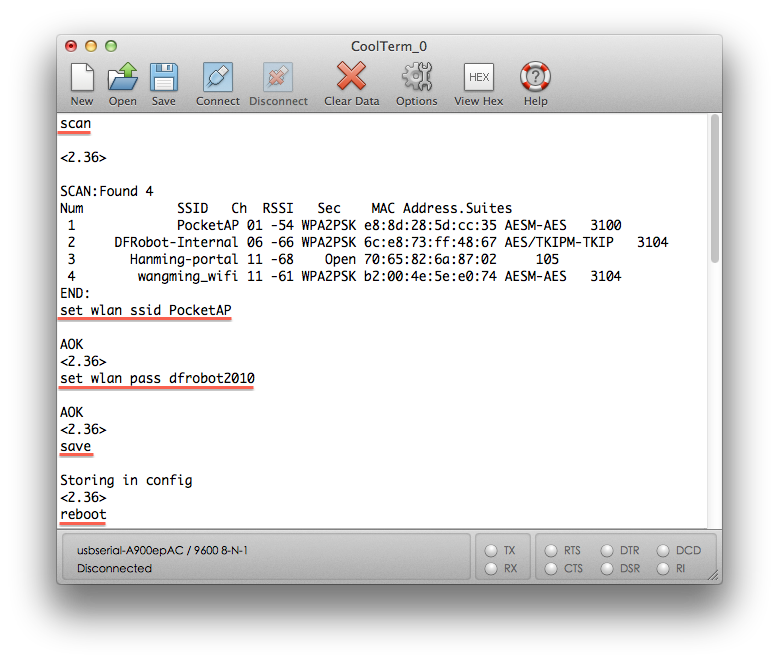 If the access is an open access point, you could inout join your router's SSID to connect to associate with it, as Figure 3 shown. If not, please go to step8. 9. After the Wifi Bee reboot, it will automatically connect to your router. 10.If all goes well, the monitor replies with current ip address and opened port. 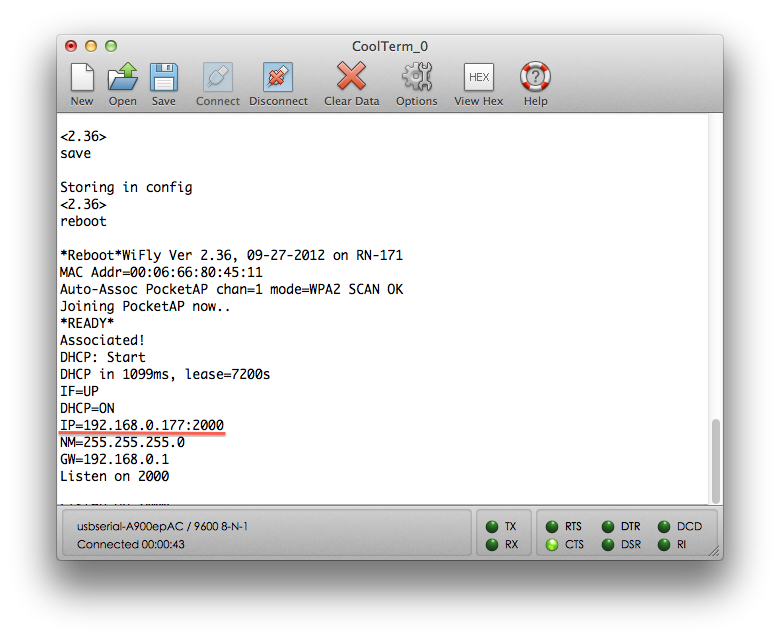 It can be easily figured out in the Figure 5 that the ip address of my Wifi Bee is 192.168.0.177 and the port is 2000. Once your message stopped until "READY" and did nothing after reboot, there is a possibility that the module haven't been set into the state of connecting wlan automatically, so you can try "set wlan join 1" before saving the config and then reboot(Page 30,Wifly Command Reference). 11.Use Web browser to access http://ip:port like: http://192.168.0.177:2000, and the monitor receives the http request from the Web browser shown in Figure 6. However, the Web browser will not receive anything for the wifi bee replies nothing. 1. If successfully connected to the router, we can use telnet instead to config Wifi Bee setting. 2. 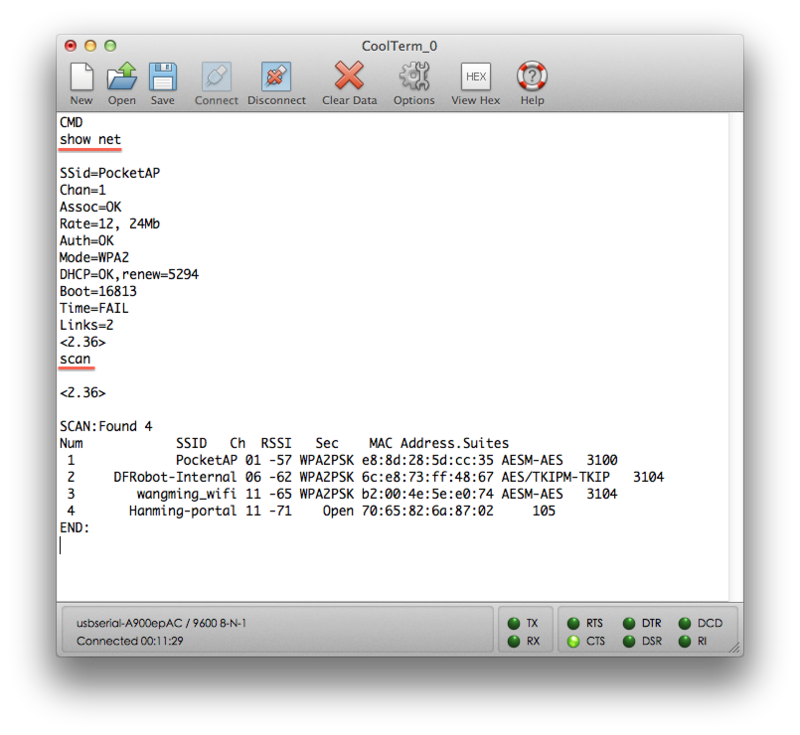 Open the CMD in Windows or Terminal in Mac. In this section, I choose putty to work as an TCP client and send commands to the WIFI Bee. 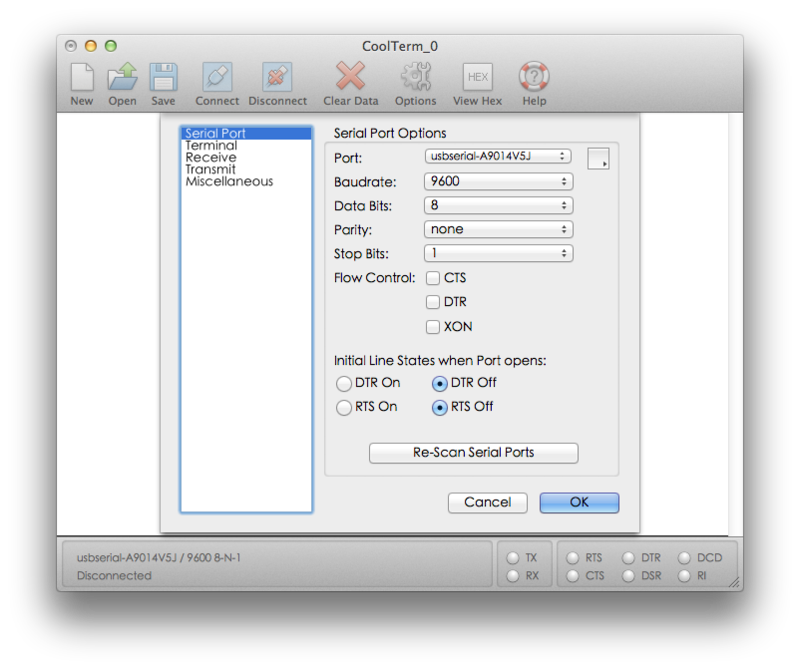 Config the Host Name and Port.Set the connection type to Raw and Press open! Then you will connect to the server created by WIFI. Now you could send commands via the TCP client simulated by putty to the WIFI shield. Thus putty will receive the strings sent from the Serial monitor also. "set ip address 192.168.0.123" This is your wifi bee ip address, the third parameter depends your gateway third one. If it is "192.168.1.1", it should be "1";and if it is "192.168.0.1",it should be "0"
"set ip gateway 192.168.0.1" The gateway of my router is "192.168.0.1". But usually it's "192.168.1.1".So please check the setting of your network also. And set the right IP address for your WIFI bee. Attention: Make sure "123" is not occupied. In this section,I plug the WiFi Bee to the I/O expansion. This sample code configures my wifi settings with WPA password on the first run if configuration is commented out. Then you must comment it back and it will run a simple server on Arduino. This webserver outputs the readings from an analog pin randomly. But it could be upgraded to use buttons and enable pins on user click. // This function should be run once whenever you change Wireless Network. // Should be disabled once the Wireless configuration is setup and working. //If we have a client Read all the browser data. Now you can watch your Arduino on the network. Note, the code will automatically refresh every 5 seconds, but you can disable by commenting out the refreshing meta tag. 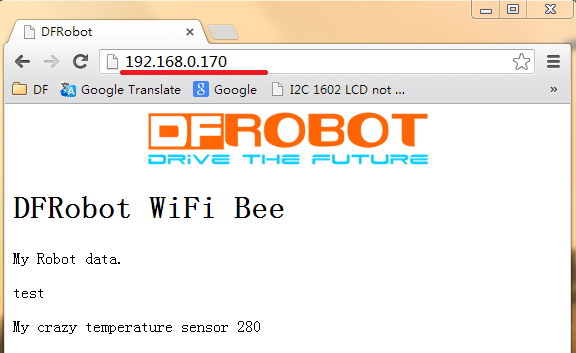 Get WiFi Bee V1.0 (SKU:TEL0067) from DFRobot Store or DFRobot Distributor.